A colourful and effervescent Boishakhi Utsob awaits guests at Amari Dhaka bringing special offerings along. The start of the Bengali New Year will see distinctive offerings from both Amaya Food Gallery & Cascade Lobby Lounge - each of which will feature a unique style of cuisine for celebrating the festive day. Amaya Food Gallery has a couple of special offerings to welcome the New Year. To start off, there is the mouth-watering ‘Boishakhi Brunch’ – a tantalizing amalgamation of breakfast and lunch items guaranteed to spice things up flaunting a rich Bengali line-up of dishes. The highlight is the Shorisha Ilish with available with an assortment of teasing bhorttas like Chingri, Chepa Shutki, Taaki Maach among others. A variety of local chaat and salads will be available as well. The Boishakhi Brunch is available on 13 & 14 April at Amaya from 11.30 a.m. to 4 p.m. at BDT 3500 net/person; bogo is applicable. 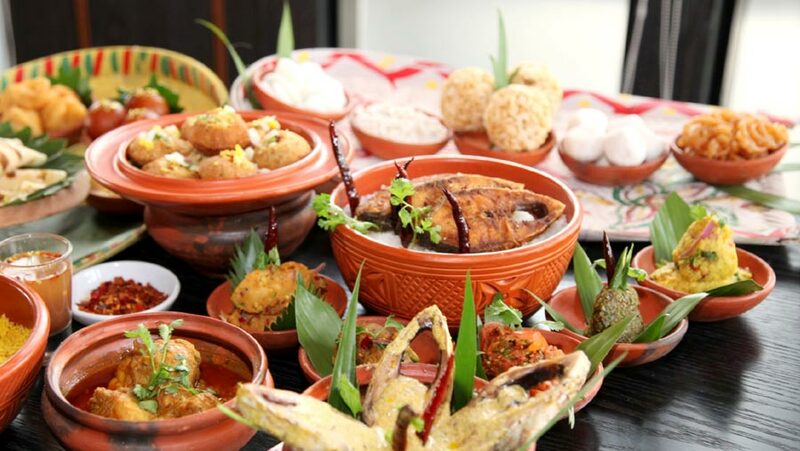 The Boishakhi Dinner buffet is the grand arrangement of a mammoth collection of Bengali New Year specials. Cardinal Boishakhi dishes such as Padma Illish Polao, Deshi Murgi Roast, Masala Pomfret along with others such as Ladka Kichuri, Khaashi Mezban & Doi Begun will be available among a vast selection of Bengali and international items. Boishakhi Dinner buffet will feature additional cuisines from Japanese, Chinese and Thai origins. The Boishakhi dinner buffet will be available on 13 & 14 April at Amaya from 6.30 p.m. to 10.30 p.m. at BDT 5000 net/person. Buy one get one for selected cards applicable. To add to the celebration, the Cascade Lobby Lounge will host a traditional Boishakhi Mela introducing more excitement to the spirit of Boishakh. The fair will include exhilarating activities such as dhak dhol, bioscope show, fortune teller, bangle seller, face painter, mehedi art, and much more customary offerings at lobby. A mouth-watering selection of local finger-foods such as fuchka, chotpoti, dahi fuchka, mutton halim, jhal muri, gulab jamun, kushtia’s famous kulfi, malai cha & others will also be served along with the presence of refreshing sorbet & lassi stalls from 11 a.m. till 10 p.m. on 14th April, 2019 only. Extravagant boishakhi themed decor will encircle all the happening outlets. Prepare to embark on a Boishakhi culinary feast! For details, please call 01777770944 or 01708124695.